I figured why not take it literally? Maybe not the chicks. I was a vegetarian for several years so I don't want to harm any animals but the egg part....maybe. I originally wanted to coat several nails in an actual egg shell but those shells are really curved, even when you crack them. They just don't lie flat at all. I had to settle for small pieces of cracked egg shell. That's right, real egg shells. I have used flocking before but found a different brand by Martha Stewart that has glitter mixed in. Love glitter as many of you already know. Really makes it look very chick-like. And, very fluffy. And, because I know you are all wondering since you plan on trying this out on your own nails, the shells do stay fixed firmly using only polish to adhere. No top coat, that would only detract from the beauty of the natural shell. What's your favorite nail polish company? For regular polish-I don't have a favorite brand. I only care about the color. For gel polish-hands down...Gelish!! Because it offers the most color variety. Glitter....Glitter....Glitter. Never too much of it!!! OPI, China Glaze, or Essie? I have plenty of OPI and China Glaze but I do not own one single Essie. I feel almost ashamed to write this. As often as I am able to. Sometimes, three times in a day, sometimes once a week. Depends on what life delivers me. What's your favourite colour on your nails? Both. I try to steer clear of brights during the week, especially if it involves nail art. My job requires that I be somewhat conservative. I usually wear darker colors. Water Marbling consisting of three super bright colors. Color Club and China Glaze. Haven't blogged about it yet so I am keeping it a secret. Matte nails in or out? Definitely in by looking at the blogging world but not really my thing. I am going to keep at it though. I do see some I like every now and again. I love a great french manicure. I also like a unique takes on the traditional french manicure, like glitter tips. 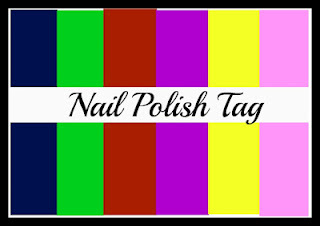 TAG ANOTHER POLISH LOVER: I tag Ducky from I Love Pretty Colors....can't wait to see what she has to say. I actually already did rainbows recently in the other challenge I am participating in. So, I wanted to do something really different for this one. I got on the microbead wagon a few weeks ago but have yet to try them out. The beads I bought were really shiny and I didn't want to take away from their pretty colors by using polish underneath. I was afraid that some of the color might coat the beads. I just used a clear coat to get them to stick. I am just so attracted to these shiny beads. They are all really pretty colors. I was thinking tht I would have no reason to use them again but I actually came up with some cool concepts while using them. I will save them for a later date. 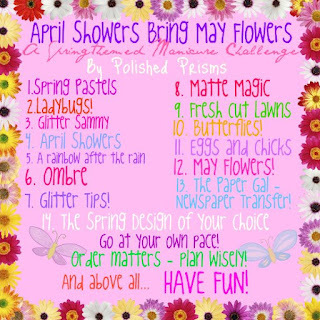 The Spring Challenge was hosted by Mateja at Purple Glitters. You can read more about her VERY creative challenge and the rules here. THANK MATEJA, This was a lot of fun!!!! Had I known, I could have given it to her this weekend in NYC, where we met halfway for a visit. So, at her request, I am using it so she can live vicariously through me. Oh, and it's also is a base for my next item on the challenge which is butterflies. Definitely not my color. Kind of makes my fingers look like they belong to a corpse. If Whimsical continues to be M.I.A. in the D.C. area, I will be shipping it down there soon. Charlotte from Charlotte's-Nails did something very similar earlier on. Great minds think alike!! I am fairly certain I will have green tinsel stuck to my hair and face and hands for the next week or so. Hard to get rid of that stuff. If I missed anyone, please leave me a comment, I think a few new people started and I don't want to leave anyone out. Keeping with the same idea of of gel polish with varying themes. Here I used Gelish Deep Sea. I have to say that I am a bigger fan of Gelish than Shellac. I love Shellac but Gelish color variety just can't be beat. I didn't take a picture of the Deep Sea on it's own because I don't really love the color by itself. I went right for a stamp. I used Cheeky CH16 with Color Club's Lumin-icecent. Looks like cute silverish flowers. The color stamped great on the navy. Same Gelish Deep Sea base, this time I stamped on top with Cheeky CH7 and Milani Violet Dash. Again, stamped beautifully. Finished it off with some purple rhinestones to bring out the purple color even more. For those that follow my little blog, you know that I am really into polish of all kinds but I love gel polish. Many times when I am doing one design or playing with items on the challenge list, I have on a base and top coat (usually in Gelish, sometimes Shellac). I keep that same base and top coat on for at least a week and change out the design with regular polish on top using non-acetone polish remover. Periodically, I like to use a Gelish or Shellac color and then do something creative on top. I am a huge fan of red. Love the color Hollywood from Shellac. I did this a few weeks ago and then topped it with dots. Not the clearest image in the world but it worked. I think it is really cool. I may try this again in the futue with a funky stamp pattern. 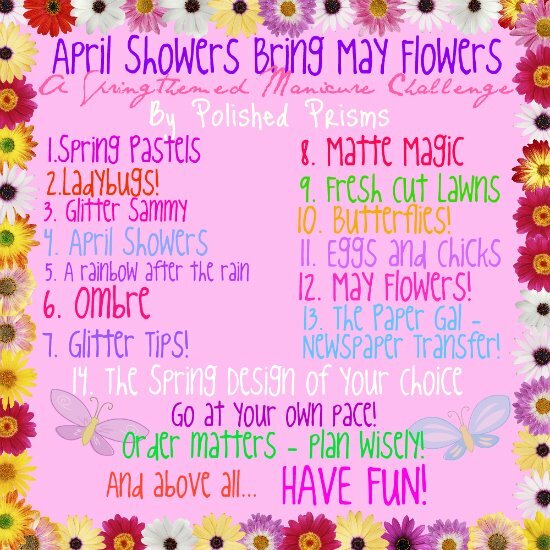 The Spring Challenge is being hosted by Mateja at Purple Glitters. You can read more about her VERY creative challenge and the rules here. I started out (since I had it on the brain from glitter tips), with two base coats of Nubar Hyacinth Sparkle. I wish the camera could catch the glitter, it just kind of looks gritty. This is with a stamp of Konad Special White using cheeky CH11. Then I applied Matte About You. Results????? Still don't like Matte. I am not giving up yet though. Just got home from spending the weekend in NYC with my cousins. Had a fantastic weekend, beautiful weather. Finally got to see the 9/11 memorial. Amazing thing to witness live. The videos I have seen just do not do it justice. Great food and great times.....love those NYC bagels. So, right off the train, I started thinking.......my next item on the Spring Challenge is due today. No idea what I was going to do. Finally decided on bright colors. I am in love with this combination. There is just something about orange and pink together that I love. I used China Glaze, Rich & Famous and Sun Worshiper. My only regret is that I would have used a larger size dotting tool for the dots. Other than that, I am really happy with the outcome. Now I need to go and take a nap. Two straight days of walking all over the city is exhusting. OK, now that I know what ombre means. I have researched this quite a bit since I saw it on the challenge list. There was much discussion on the facebook page regarding whether this means fading colors on the same nail or from one nail to the next. It seems that there is no clear answer on this. I did learn that it is french for shaded so I guess that means you can shade whatever, and however you like. I like both looks but I LOVE that clean transition on one nail when it comes out right. And.....I love the opportunity to use purple in any way, shape or form. So here is my "ombre" using the sponging technique with a cosmetic sponge. I used Revlon's Impulsive and Charming and Milani's Violet Dash. Of course, I started out with a white base coat. Some imperfections because I did the base at night and then went to bed after two coats so there are some subtle wrinkle marks. Even with the flaws, I am totally in love with the color. 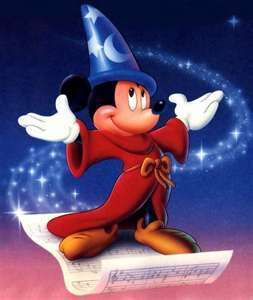 Lindsey over at The Neverland Nail Blog is having a nail art contest called Do you believe in Magic? You can read more about the rules here. Now, I have to admit. It isn't my favorite topic. Not really into fairies and magic. I told a friend about it and she suggested I do Fantasia from Disney. Loved the idea. I am not that great at drawing so I tried to display the power of magic in other ways using very noticeable references from the film. The hat, wand and glitter for the "magic" of course. What is always amazing to me is that you can buy the best quality brush and just take it out of the box and there is always that stray piece that is either going in it's own direction or longer than the rest by a smidge. Here we are at item #4 on Hannah's list. April Showers, can I just say that I really spent quite a bit of time thinking and over-thinking this. I tried a whole look with umbrellas and long tinsel for rain but it came out looking like a third grader might have painted it in art class. I will show you my attempt in a small photo at the end of this blog. If nothing else, someone with better art skills could use it for inspiration. So......what I ended up with, I still don't like but I surrender. It is what you and I are stuck with. I am totally in love with Sally Hansen's Ice Queen. Love the purple and blue glitters. It does remind me of rain. This was definiely my least favorite so far. The others challenged my skills and forced me to try new things. This challenged my brain and.....well.....you can see where that turns out. 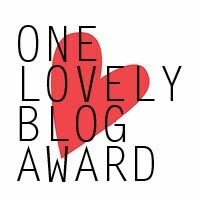 Now, I wanted to say a big thank you to Anna from Anna's Dope Blog for giving me the one lovely blog award. This award asks you to list 7 things about yourself and then asks you to nominate 15 people for this award. I will list some things about me because I love to read about other people when they do the same but I am not going to tag people specifically because I had mixed reactions the last time I did this. Some people were pleasant but you can tell were annoyed at receiving a tag for it. Others didn't even acknowledge it at all. It does involve quite a bit of work and not everyone has the award on their page so you may be giving it to someone for the 100th time. Truthfully, I follow 174 blogs. I think they are ALL equally lovely!!! 1) I ride a motorcycle. 2) I scuba dive and have done more than one shark dive. 3) I am addicted to reality TV (social worker by trade...perfect fit). 4) I am obsessed with pugs. 5) I love working with the elderly. OK, back to my peek at the first try for April showers.....ready?